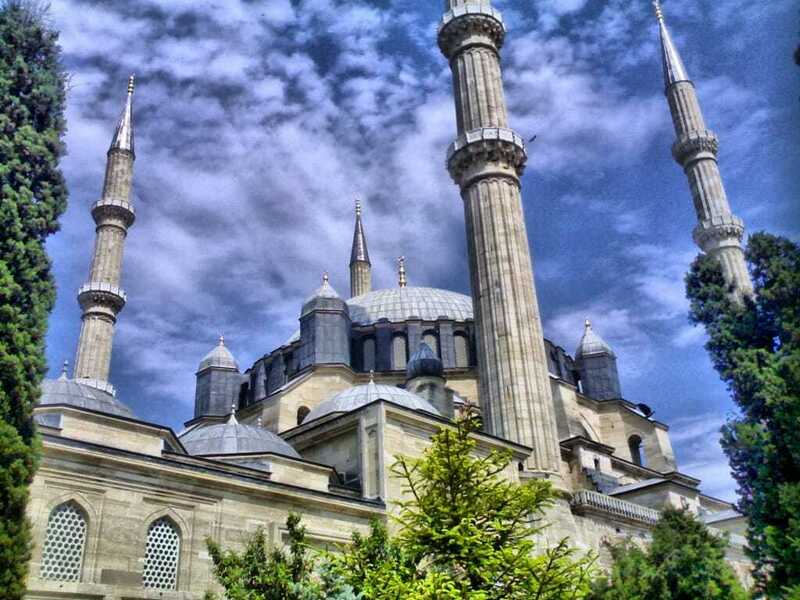 Edirne Tour from Istanbul; driving about 2 hours for to go Edirne was the second capital city for ottoman empire and is a gateway of Turkey opening to the western world, the first stop over for newcomers from Europe. Departure from hotel early morning and return late evening Eski Camii, was built of cut stone and brick 1402-14 with fine white marble portal and decorative calligraphy on the interior walls and pillars. Üç Serefeli Camii, the name of the mosque derived from the three balconies on the southeast minaret. Each balcony is reached by a separate stairway. The decorative tile designs on the minarets are all different. The minarets were the most important development in the structure of the mosque in the fifteenth century. Selimiye Mosque Edirne’s crowning glory, was built for Selim II, (1566-74) by Sinan who was the architect of the Abode of Felicity for 50 years. It was the masterpiece of Sinan’s old age. The symmetrical design strongly emphasised by the four minarets and the soaring rise of the central dome. Lunch Semiz Ali Pasa Arasta is also the work of Sinan. Completed in 1589, it is a long tunnel-like building with shops on both sides. Here you may buy one of Edirne’s specialities, soap shaped like fruit or vegetables. Meric Bridge (New Bridge) constructed at the junction of Meriç and Arda rivers between 1842 -1847.Kule Kapisi (12 C Tower Gate) is all that remains of the tower which once protected the principal gate of the citadel. It was rebuilt by the Byzantine emperor John Comnenus II (1118-43) as part of his repair of the Hadrianic defensive system. Beyazit Kulliyesi is the largest in Edirne, the complex had a mosque and an hospital which was famous for the skill of its surgeons. In the octogonal, domed timarhane the insane were treated by musical therapy.